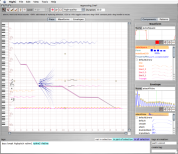 HighC is a graphical music creation tool. It is a synthesizer, a sequencer and a mixer. Its goal is to make music composition as simple and direct as sketching. It is a fun and educational tool in the hands of amateurs or children, and yet it meets the needs of demanding professional musicians. HighC makes advanced audio synthesis techniques available with a gentle, graphic approach. Hints: Tips to help you take advantage of HighC. Samples: Some example short compositions made with HighC.